Attach a stirrup (handle) to two high cable pulleys. Position a bench or chair midway between the two pulleys. Grasp a stirrup in each hand and sit directly under the pulleys, holding the stirrups using a neutral (aka parallel) grip (palms facing each other). The cables should be pulled taut, your arms should be fully extended, and your shoulders should be stretched upward. Exhale as you pull the stirrups downward until your elbows are by your sides. Hold for a count of two, stick out your chest, and squeeze your back muscles. Inhale as you return the stirrups to the starting position, with your arms fully extended and shoulders stretched upward. Keep your back and neck neutral. 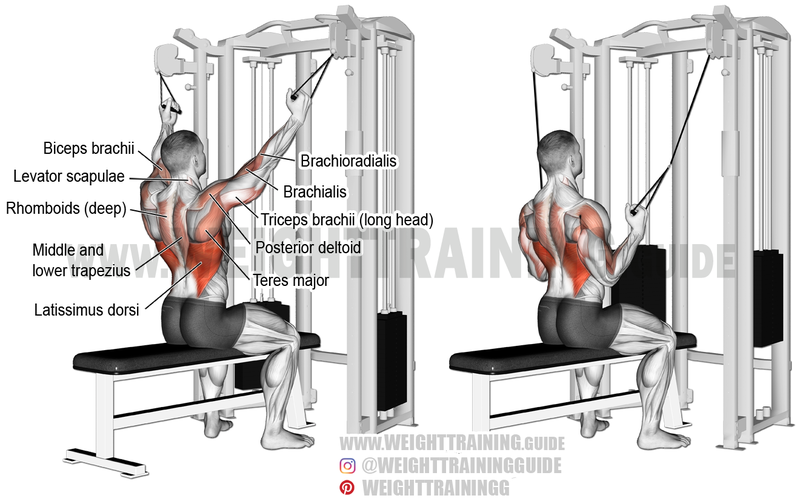 The double cable neutral-grip lat pull-down is a brilliant exercise with which you can build your back and arm muscles and develop upper-body strength. The exercise can also be performed unilaterally (i.e. one side at a time). Therefore, to get the benefits of both worlds, you should sometimes perform it unilaterally. Instead of sitting on a bench, you can just kneel on the floor. See the video. Also known as the dual cable lat pull-down. This is good for bicep? ?